This unique itinerary on Star Clipper showcases the best of Indonesia, from unspoiled islands to pristine beaches and beautiful villages. Snorkel in the turquoise waters surrounding picturesque Gili Kondo, before heading to the island of Komodo in the UNESCO-listed Komodo National Park, home to the famous Komodo Dragons and spectacular Pink Beach. Admire the impressive Waikrlo waterfall on Sumba Island, watch the locals making traditional wooden boats in the small village of Wera and disocver the impressive caldera on Satonda Island, before cruising to Moyo Island, a beautiful nature reserve home to an abundance of wildlife. Discover the stunning white sandy beaches and spectacular flora of Gili Kondo in East Lombok. The waters surrounding the island are perfect for snorkelling as they are home to an array of tropical fish and corals. 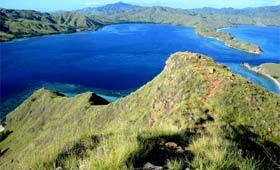 Komodo is one of several volcanic islands which make up Komodo National Park. The park was founded to protect the Komodo Dragon and is now designated a UNESCO World Heritage Site. As well as the famous Komodo dragons, the park is home to a variety of other animals, including sea turtles and the orange-footed scrub fowl. Explore the beautiful island of Komodo today, and enjoy a visit to its iconic Pink Beach. Discover the impressive Waikelo waterfall on Sumba Island in the heart of the Lesser Sundra islands. Perhaps swim in the pool below or explore the surrounding villages, including Waikabubak and Tarung. Explore the traditional village of Wera on the island of Sumbawa. The village specialises in building traditional wooden boats. Meet the locals or take a stroll along the beautiful beach. Satonda Island was formed by a volcanic eruption. Perhaps enter the caldera with its magnificent black lake, or explore the dense jungle which is home to thousands of fruit bats. The waters surrounding the island are rich in corals and tropical fish, so perfect for swimming and snorkelling. Continue to the village of Labuan Haji on Moyo Island, a beautiful nature reserve. The island has breathtaking scenery and is home to an abundance of wildlife, including wild ox, macaque monkeys and Rusa deer. Take a stroll or perhaps snorkel in the turquoise waters surrounding the island. Visit Carik before heading to Senggigi beach which stretches for several kilometres and is the main tourist spot on the island of Lombok. Admire the stunning backdrop of mountains and palm trees or take a stroll past the restaurants and hotels which overlook the beach. Lovina Beach is located to the west of Singaraja and the perfect place to relax. There are several small villages along this stretch of coastline including Kalibukuk, considered to be the hub, and Pemaron and Anturan. Perhaps go diving or snorkelling between the coral reefs and discover an array of tropical fish or stroll past the tourist stalls and pick up souvenirs. Dolphin watching tours are popular here. The tranquil island of Gili Sudak has beautiful white sandy beaches and reef beds, home to tropical fish and starfish. Take a stroll around the island, go snorkelling or soak up the sun on one of the beaches.